Let's say you are a lover of Italian Dress Shoes but you just don't feel like spending several hundred dollars on a pair. Well thanks to the good People of Giorgio Brutini, they've got your back. When it comes to making a lasting impression, you want to do it right the first time. 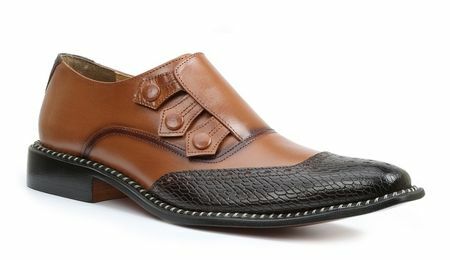 Giorgio Brutini Leather Dress Shoes are just what you are looking for. It's no secret that Giorgio Brutini Dress Shoes use quality calfskin leathers that look and fit great. These Giorgio Brutini Vintage style Leather Dress shoes features Black lizard Print Leather and rich calfskin in a D Width with a Style that people will not forget. Sole is Genuine Leather.